I�m looking for a film. A retelling of Dickens A Christmas Carol, featuring stars of 80s kids' TV show Rainbow and former CBeebies stalwart turned �ber-babe Sarah Jane Honeywell. And a former Doctor Who. And maybe the original lead could�ve been a fading acting great, who shuffled off this mortal coil just as filming started, like Bela Lugosi in Plan 9 from Outer Space. And I want it mainly shot on blue screen. Well, we spoke to co-directors Chris Clark and Richard Dutton to see if they could meet this very specific request. Hello chaps! Tell us about your background, and your roles in Shadows of a Stranger? Chris Clark: I'm co director, I play Xander and I'm also the visual effects artist amongst other things. Richard Dutton: I�ve been making films ever since I was a young lad when I used to borrow my dad�s camcorder. I�ve always made films local to where I live in Lincolnshire, collaborating with different filmmakers and drawing in local actors. The area I live in is not often recognised as a place for making films, but instead of it inhibiting my ambition I�ve tried to work against the odds. When things were looking bleak with my filmmaking endeavours, I dug up an old script of mine that had been put on the shelf because it was way too ambitious for anyone without a 7 figure budget. 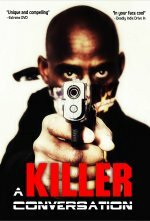 I showed it to my friend Chris, who read it all in one night and said that whatever happens, this film had to get made. We soon realised the only way that would happen was if we made it ourselves, and so Chris came up with the idea of shooting it all on blue screen, all in the one place, and then constructing comic book style environments in post. As I had written the script and knew the characters best of all, I directed the performances of the actors during the shoot. As Chris had devised his own technique for the visuals, he co-directed with me so he could direct the technical side of things. 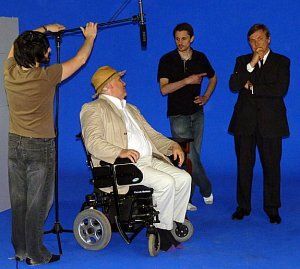 Chris Clark: A handful of us are going to end up hogging every credit - some days I'd be nipping behind the monitor to supervise a shot, running onto the bluescreen to deliver some lines, then holding the boom for the next shot still in full costume! Aha, blue screen! We are getting closer to David Walliams fictional request (and the tenuous opening to this article!) What�s the film about? Richard Dutton: The film is about a private investigator who takes on a job to find a missing man, and also happens to meet a psychic whom he teams up with. It naturally leans towards film noir with its dark, psychological elements, and has a strong emphasis on characters and narrative. What was the inspiration for the movie? Chris Clark: Obviously Rich was inspired by A Christmas Carol and films like Se7en when he was writing the film, but my inspirations are mainly relevant to the visual aspects of Shadows of a Stranger. My task early on seemed to be finding a way to bring Rich's amazing script to the screen in the most original, cheap and visually pleasing way possible and one evening the idea came to me to shoot it against a green screen (later to become bluescreen (thus fixing the entire shoot to one location and set... nice and cheap!)) and make it look as if it was an existing comic book - I was watching Watchmen at that particular moment. I immediately sent a text to Rich, asking if he thought I was mad. The reply was a wary but good one! So that week we sat down together and watched Sin City for our main source of inspiration. Richard Dutton: Yes, Se7en was heavily in my mind when I wrote the script. When I saw that film I thought it was exactly the sort of film I�d like to make, a descent into the dark depths of the human psyche, so Shadows of a Stranger was a case of writing the sort of film that I would like to go see at the cinema. With all the dark things in my script, I thought a backdrop of Christmas would make for good counterpoint in the film, and so that it didn�t become monotone. Because of the Christmas setting, I�d deliberately put in a couple of references to A Christmas Carol, but when I redrafted the script, I realised it ran much more deeply than this. Understandably at this stage, I don�t think many people quite get where we�re going with the A Christmas Carol allusions � I hope when people finally get to see the film it�s something that will get them thinking. I think that on a narrative level and also on a visual level, there aren�t many filmmakers that have taken the path that we have. You�ve assembled an impressive cast. Colin Baker! Are you a big Doctor Who fan? What was it like to work with the 6th Incarnation? Chris Clark: I've always loved Doctor Who. I started watching during the Peter Davison era when I was very young indeed and the first regeneration I saw was the one into Colin Baker. I guess I would refer to Colin Baker as My Doctor, so I was very excited to be able to work with him but also insanely nervous at the thought of having to direct him! My nerves soon subsided on Colin's first day though. He's great fun to work with and he enjoyed taking the mickey out of me! We were very lucky to get him - he's absolutely perfect for the role of William Fallon. Richard Dutton: I count myself as a Doctor Who fan, although I�m not as geeky as a lot of the other people I�ve worked with on this film! Colin was �my� doctor of course, and I was absolutely thrilled to work with him. 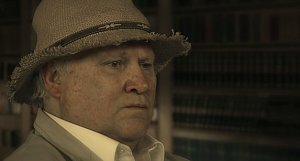 For filmmakers such as us, when you have someone like Colin Baker saying yes to your script then you know you�re on some very good lines. It felt surreal when he first turned up for filming, but he gave a mouth watering performance and I can�t wait to see his part within the context of the completed film. You�re also running a good line in kids� TV nostalgia. Sarah Jane Honeywell, recently exiled from CBeebies for those pictures, and Rainbow�s Jane Tucker (Rod, Jane and Freddie) and Malcolm Lord (Bungle). Is that by accident or design? Chris Clark: It started off with Jane. She was the first to agree to play a role in the film. Around the same time, I'd started chatting with Malcolm Lord and thought it'd be great to have him involved too. Next came Sarah Jane - aren't those pictures great! And how come she gets into trouble when we regularly see Big Cook Little Cook and 'Archie' from Balamory swearing all over Channel 4 at night!?! Haha! I'd seen Sarah Jane on TV a lot (I have young daughters!) and she just seemed to stand out. She's entrancing to watch and listen to. After stalking her a bit on Facebook(! ), I learnt that she was keen to be in films so I decided that we HAD to contact her. I think by that point it was definitely becoming a conscious decision to get kids' TV stars involved. Rich and I loved the juxtaposition of these bright children's telly stars being put into the sinister city of Meridian! Richard Dutton: I always find it refreshing and intriguing seeing actors perform in things that are completely different from what we�re used to seeing them in. Again, I think it helps with our film�s contrast between darkness and lightness, and maybe it�s part of a theme of corruption, innocence turned into something sinister. Even the most radiant of people have a shadow. I looked over Jane�s IMDb-profile, and it doesn�t look as though she�s graced our screens since Rainbow got cancelled � over 20 years ago. How did you convince her to come back? Chris Clark: Well, Jane is a good friend. My sisters and I were Rainbow fans when we were kids and we wrote letters to Rod, Jane and Freddy! Remarkably, they always wrote back and so as we grew older we sort of made the transition from fans to friends! I'd talked to Jane a lot about collaborating on something and out of all my hairbrained schemes to do something arty, Shadows of a Stranger seemed to be the thing that interested her the most. Richard Dutton: I identified a great point in the script where she could appear so I specifically wrote the role for her � I was really pleased that Jane loved the role and completely made it her own. It�s definitely going to be one of the best scenes of the film. Did Malcolm stick his Bungle head on for you? Chris Clark: You'll never believe this, but yes, Rich and I did get to see Malcolm with the famous head on! He even let us play with Zippy and George!! We have photographic evidence too! Richard Dutton: And there was also the time we went into his panto dressing room and admired all of his amazing frocks. I even got to feel his (fake) breasts. How long have you been trying, and what did it take, to get this project off the ground? Chris Clark: Rich and I had talked about doing our own movie project from about late 2008 I think. Once Rich had actually let on that he'd written this amazing script (early 2009 I think), we discussed various ways of making the project actually happen. We approached funding people but as we had no back catalogue to show them, it was a dead end. That's when we decided to put our hands into our own pockets (Rich's mainly). 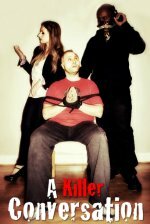 We soon came to the conclusion that if we could make an amazing, original film on no budget, then we'd probably be pretty unique! 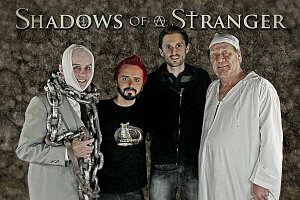 Richard Dutton: Before Shadows of a Stranger we�d worked on various different projects that didn�t take off, so this was kind of a last chance ride for me. We could only do it with total passion and belief and by being completely bull-headed. With this approach things naturally fell in place for us. We did pursue funding but it soon became clear that it would take a monumental effort to get anything and I didn�t want this to drain our energies, so we decided to throw caution to the wind and finance it ourselves, making it all about the art rather than the business side of things. If you�ve got people that share your vision and believe in what you�re doing then you can make things happen. How long did the process take to get to the finished product? Chris Clark: We haven't finished yet! But it'll be done this year! Promise! I guess it's going to be over 3 years by the time we're done. Preparing the project to be shot took nearly a year in itself. 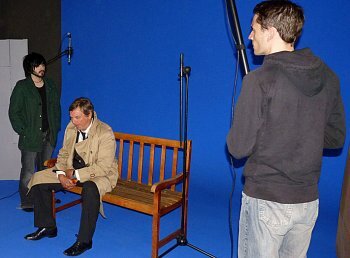 We then shot for about 4 months in the summer of 2010 and we've been in post production ever since! What problems did you have to overcome in the making of this film? So that�s all the made up, tenuous film request in the start of the article covered! It sounds brilliant! On with the interview. Who are your influences? Chris Clark: As a director my main influences are probably Terry Gilliam, Jim Henson and Frank Oz! They bring/brought uniqueness to their films and a lot of magic. As an actor, Gary Oldman - He's just so f**king versatile! Richard Dutton: Filmmakers like Robert Rodriguez and Gareth Edwards are a big inspiration, guys who went out there and made impressive films with limited resources. I suppose I take influence from a lot of different areas. To make a good film I think it helps to understand and study the whole of the human experience, not just techniques on making a film, and plus I don�t like to be too led by other filmmakers and end up making stuff that�s been done before and everyone has already seen. So I take inspiration from everywhere. Do you think this is the genre you will stick with, or do you want to explore other things in your next film? Chris Clark: I love this genre and I would return to it for definite but I'd like to do comedy too (especially comedy acting). I also love horror. I really want to make a puppet movie though. Something like the Dark Crystal. Something that won't rely too heavily on CGI - it's all done in camera! Richard Dutton: I think there�s a danger of becoming a one trick pony if we stick to the blue screen route, and plus I think we�re fed up of keying out all this blue! As for genre, I think my natural comfort zone is always going to lean towards darker, psychological material but there�s a lot you can do with that; I�m not set in a particular genre. In fact, I�m really interested in merging genres within films, stepping outside the box. As long as it�s something that people relate to and find relevant, that�s the most important thing for me. Would you like to say a few words about your cast and crew. Chris Clark: They're all pretty magical people for being so generous to our project. Their belief in what we're doing is invaluable really - especially when it's late at night and I've been animating the same 7 seconds of a scene for the past 12 hours!! You really rely on that kind of support to keep going! Richard Dutton: I think when you�re making a film it�s really important to find people who are on the same wavelength as you. I think the general excitement of the project naturally drew in people who wanted to be a part of it. I�m particularly pleased with the casting process we undertook as we spent a lot of time finding the right people and putting together a great cast � it�s a combination of well known actors such as Colin Baker, and also local actors - it�s possible we may have unearthed one or two emerging talents here. Have you seen any movies recently that really impressed you? Chris Clark: I usually disagree with the masses about which are brilliant films - Planet of the Apes for instance was average and didn't make me cry once! I watched Bunny and the Bull fairly recently and I loved it. It's so original. Submarine was nice too. I finally watched Brazil after all these years and that blew me away. Terry Gilliam is an absolute genius! I love all of his films actually. Richard Dutton: One that comes to mind was a film I watched over Christmas, In Bruges. The Swedish version of Girl with the Dragon Tattoo was pretty impressive, and has some similarities with our film actually. There�s a few films that I�m really looking forward to seeing this year: Dark Knight Rises, The Hobbit, and Prometheus. Given a bigger budget, is there anything you�d have done differently with this film? Chris Clark: I'm sure there are loads of things that we'd have done differently but I'm not sure the project would benefit. Often it's the creativity displayed by filmmakers whilst trying to overcome the inevitable problems/restraints that a low budget project brings, that make it more original and interesting. Take the old Red Dwarf for example. It was budget problems that made that show so quirky and when they actually had money, it seemed that something was missing. Star Wars is an obvious example too. We use the budget limitations to our advantage all the time. Richard Dutton: If money was no object I�d probably have gone to a big city and shot it (maybe in America), but then maybe the film would have had a completely different vibe to it if we�d shot it with significant financial backing. I think the spirit in which a film is made can translate itself into the end product, and certainly with Shadows of a Stranger we have a film made with total creative freedom and nothing has been contrived through an attitude of trying to create what we think audiences want to see. What are your ambitions for this movie? What would you like to achieve with it? Chris Clark: The sky is the limit as far as we're concerned. I think my dream would be to gain a real cult following like Donnie Darko did (another movie that I love!). We've been overly ambitous on purpose and made the film to suit the big screen so I'd like to see it in a few cinemas if possible. Richard Dutton: I�ve never wanted to put any limitations on what we could achieve. It would be really great seeing it in cinemas, but for a film with virtually no budget it would be difficult to get there. But you never know. What would your advice be to someone who is thinking of making an independent movie? Chris Clark: Don't be scared by lack of money! Just have the audacity to try and make another Avatar with 12 pence if you want to! Even if it's a pile of poo, it'll be a learning curve! Richard Dutton: I would say don�t dwell too much on your limitations or your obstacles, and believe in yourself. George McFly in Back to the Future is a good demonstration of how that works (and doesn�t work). Time for a kooky question. Would you ever consider a duet with Justin Bieber? Chris Clark: Possibly. Would I be allowed to take a baseball bat with me? Richard Dutton: I think a duet with him would eclipse the awesomeness of the song The Long and Winding Road by Will Young and Gareth Gates. I hope we get to sing You�re The One That I Want. We could even put it on the soundtrack to the film. Oh I hope I get to touch him. 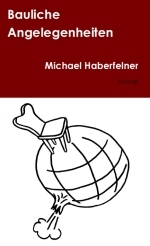 A nation crosses their fingers that he�s reading! Anything else you want to plug? Chris Clark: Yes! We need to mention Barnaby Edwards and Ian Cullen. They are late additons to our cast and they're ace!